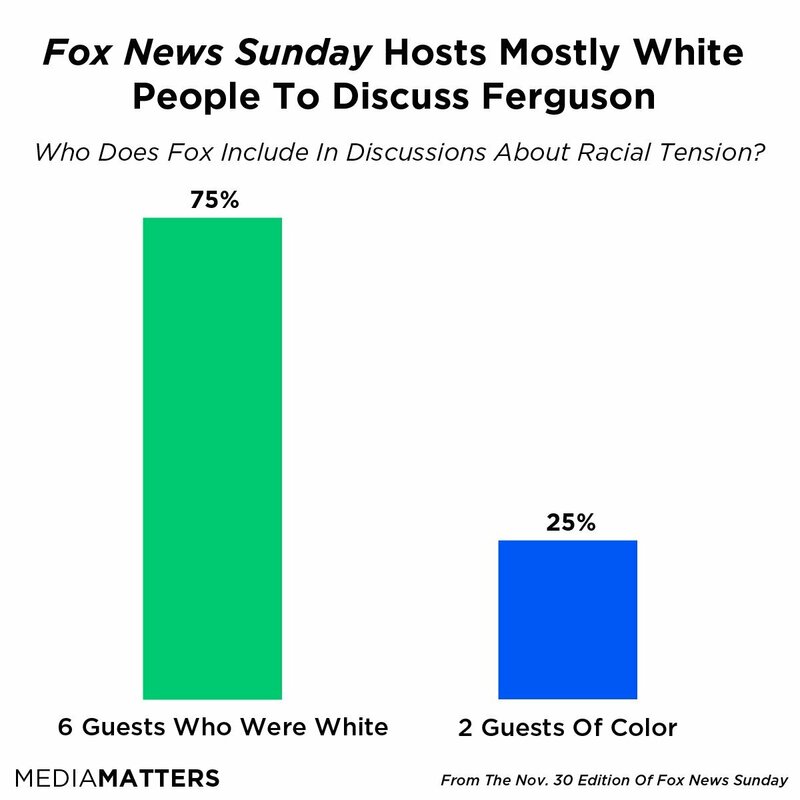 "Fox News Sunday" had a disproportionate number of white guests on air to discuss the protests in Ferguson, Missouri, and the resignation of officer Darren Wilson, according to a report by Media Matters published Monday. On Nov. 30, "Fox News Sunday" invited six white guests and two guests of color to discuss the events unfolding in Ferguson. The debate centered on the killing of an unarmed black teenager, Michael Brown, and the greatly affected black community in America. "On Fox Broadcasting Co.'s Fox News Sunday, an all-white panel discussed the developments in Ferguson and how the United States can best combat racial discrimination," the report reads. "The show also hosted a separate discussion with two lawyers in the case, one of whom is white, and held solo interviews on the topic." 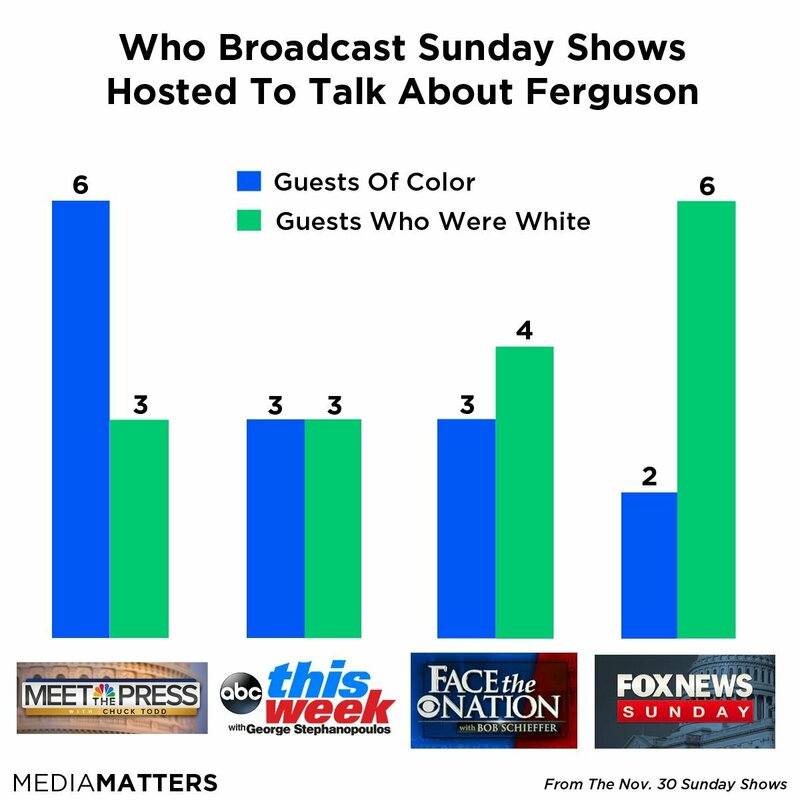 Sunday talk shows on other networks offered more diversity in their handling of the discussion, however. "On November 30, 67 percent of guests on NBC's Meet the Press during segments on Ferguson were people of color, or six out of a total of nine," the report reads. "ABC's This Week hosted three white guests and three black guests, or 50 percent, while CBS' Face the Nation hosted slightly more white guests, four out of a total of seven." Studies have shown that people of color are often under-represented on television news, regardless of the topic of conversation. In July, progressive watchdog Fairness and Accuracy in Reporting (FAIR) found that 84 percent of guests on top cable news shows were white.